I’m always surprised that an ugly, gnarly vegetable as celery root can be transformed into a puree that’s an interesting side dish sort of like mashed potatoes, but not quite. 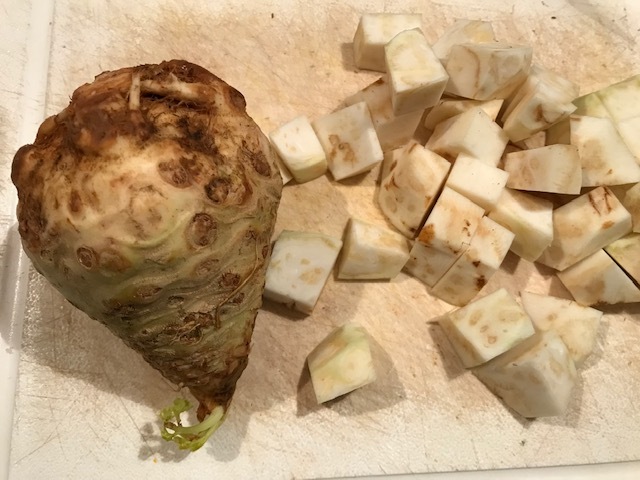 I still had a few bulbs of celery root from my fall CSA languishing in my fridge, so no sourcing challenges on this one. This was easy enough to make, but I’m not completely sold on the idea of cooking the vegetables in milk. I have an aversion to milk on many levels. I’m the person who, when eating a bowl of cereal, will drain all the milk off the spoon before each bite. When the milk disappears into the dish, like in a cake or even a soup, I can deal with it. 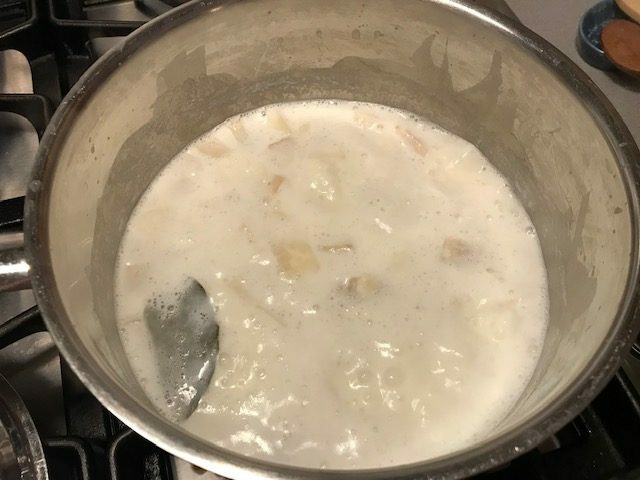 However, using milk as the liquid vehicle for cooking the celery root and potatoes, it got so curdy and rather repulsive to look at. I won’t be doing that again. I took the lazy path and mashed the cooked veggies with a potato masher. If I had a do-over, I’d pull out the ricer for a smoother result. 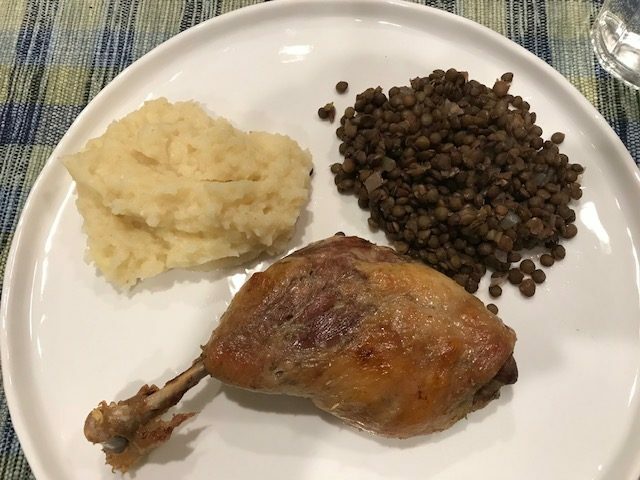 I served the celery root puree alongside duck confit (made by Howard) and lentils. It felt quite French and was delicious. I like the flavor of celery root, but I would cook it in water, not milk. adding a little warm milk if needed. The recipe is found on page 217 of David Lebovitz’s My Paris Kitchen. Cook the Book Fridays made this recipe a couple weeks ago, but you can still see their reviews here. Posted on 8 February 2019, in Cook The Book Fridays, my paris kitchen, Winter CSA and tagged celery root, Cook The Book Fridays, my paris kitchen. Bookmark the permalink. 1 Comment. I also have an aversion to milk – I use the least amount possible when I have cereal but I actually think it does add some richness to this recipe. Your meal looks amazing!